Spring is in the air and tender asparagus abundant. My cooking is at its creative best when improvising in the kitchen. 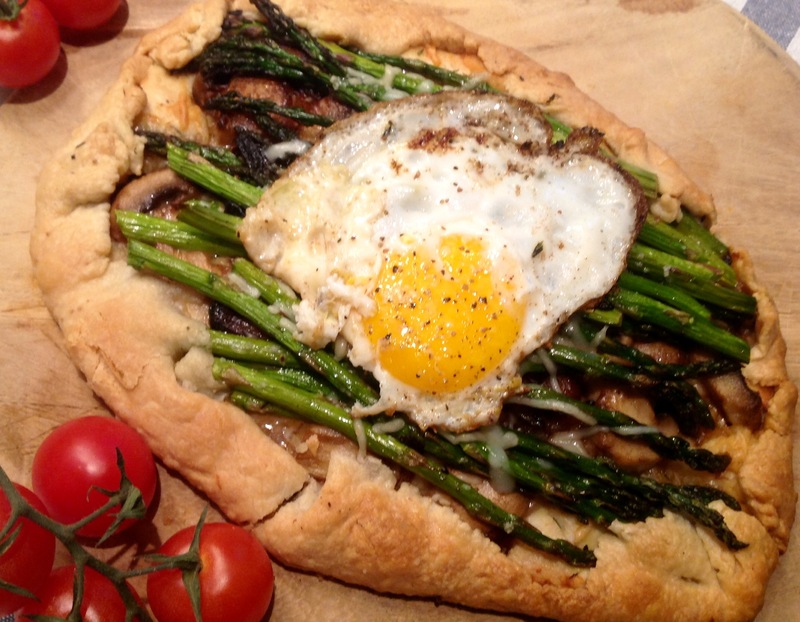 With some leftover pastry dough I combined fresh asparagus, mushrooms and shallots to create this tasty little rustic tart, literally, thrown together in the spur of the moment. It was so good, I just had to share it with you! Here’s how I made it: I rolled out the dough of about half a pie crust, placed it on a cooking sheet lined with parchment paper. Leaving a 1 inch border of crust to fold over, I smeared about a tablespoon of brown mustard on the bottom then seasoned it with a pinch of dried thyme. Over this I sprinkled a quarter cup of shredded cheese, a mixture of swiss, gruyère and parmesan. In a bit of butter, I sautéed 8 ounces of mushrooms with one thinly sliced shallot until softened. I spread this over the cheese. In the same pan I flash cooked half a pound of thin asparagus, trimmed to the size of the crust, so they remained crisp. In order to be able to cut this galette in 2 and give each serving some asparagus spears, I laid half the asparagus in 1 direction and the other half in the opposite direction. The tart went into a preheated oven at 400 degrees F for 20-25 minutes until the crust was golden and the cheese melted. Just before it was done, I sprinkled 2 tablespoons of cheese on top of the asparagus. While the tart was resting, I fried an egg to serve on top, seasoned with cracked black pepper and a sprinkle of sea salt. 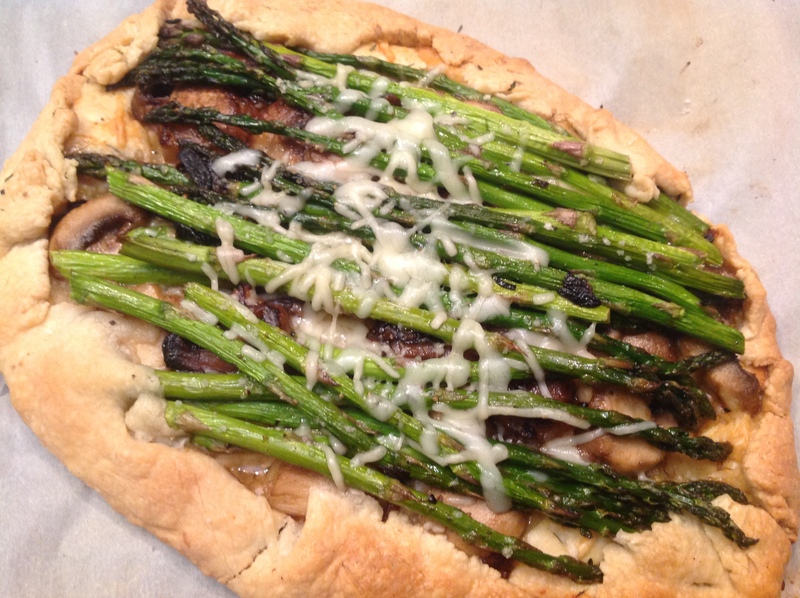 So good and so easy for a quick weeknight dinner showcasing the first asparagus of the season. This mini tart served 2. If you want to make a tart to serve 4, use a full pie crust recipe and just double the ingredients. 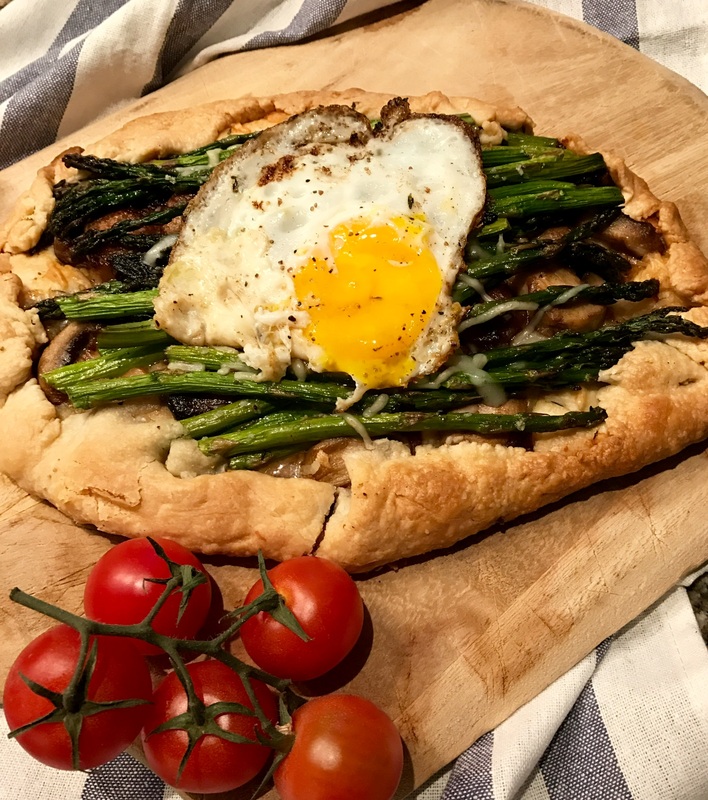 This entry was posted in Recipes and tagged Asparagus galette, asparagus mushroom galette, rustic aspargus tart by Johanne Lamarche. Bookmark the permalink. A perfect meal in by book Johanne, I could eat that everyday! 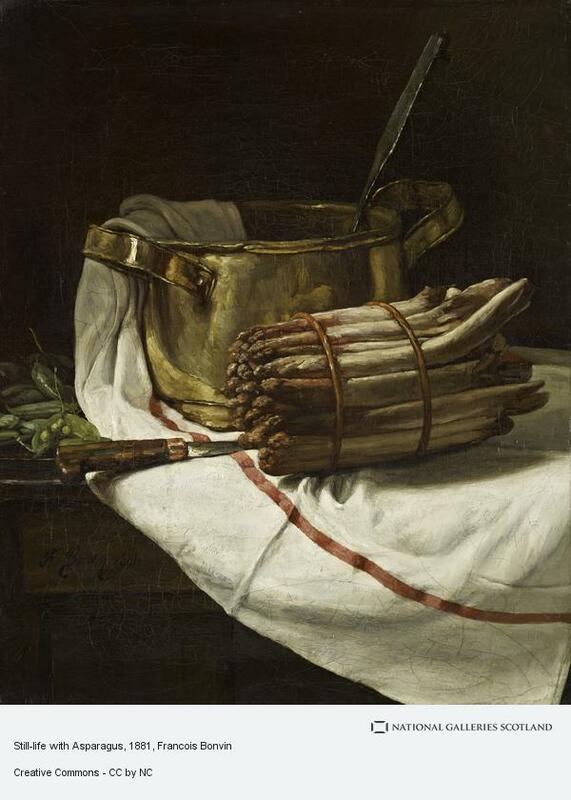 I love asparagus, haven’t tried it with an egg, sounds divine! Oh my goodness, this looks incredible. Such a winning combo of flavors. I can’t eat enough asparagus this time of year! Me too! So easy and good. Thanks, Josette. Thanks Elaine! My favorite kind of cooking!